Christof Schläger ist born 1958 in Beuthen (Oberschlesien). After an studys of process engineering and civil engineering, he started with first sound performances in 1980. Since 1987 he directed many exhibition projects in the "Maschinenhalle Teutoburgia" (art space) and initiates the "Kunst-Wald"-park in Herne. Participation in many multimedia concerts and festivals at home and abroad., among others in Krakau, Lille, Barcelona, New York, Tel-Aviv, Hong-Kong, Helsinki, Shanghai often in cooperation with the Goethe-Institutes. 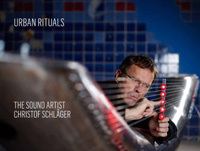 Some outstanding projects: 2010 "Schwingungen" urban landart concert for the cultural capital RUHR 2010, "Urho & UrHo" Opening Helsinki Festival 2013 with an icebreaker concert, "Magic Square" 2013 in Shanghai and "Ausklang" concert 2015 - for the anniversary of Karlsruhe. He live and work as an artist in Germany and Netherlands.